There are local bragging rights up for grabs tonight as Hemel Hempstead town visit Berkhamsted in an all-Dacorum semi-final of the Herts Senior Cup. The winners of the clash will book themselves a place in the cup final at the County Ground in Letchworth against either Boreham Wood or St Albans City. Conference South side Hemel go into the game as strong favourites, with three divisions separating them from their Dacroum neighbours who ply their trade in the SSML Premier Division. The Tudors will be aiming to bounce back from a home league defeat against Bath on Saturday and maintain their impressive run in the competition so far, having scored 23 goals in the previous three rounds. Berkhamsted, meanwhile, have knocked out London Colney, Hoddesden Town and Leverstock Green to reach the last-four of the competition. The Comrades’ winning streak came to an end on Saturday with a 3-0 defeat at the hands of Hadley. 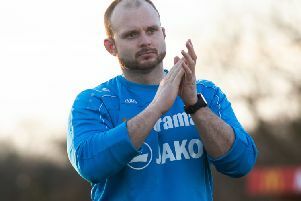 Changes are expected to be made to the Hemel starting XI that lost to Bath on Saturday, with Tudors boss Dean Brennan looking to give youngsters a chance during the latter end of the campaign. Kick-off tonight is at 7.45pm at Broadway. Follow Gazette sports editor at @Gaz_Sport for live updates from the game.